CARRIE MILLER PHOTO | SWAT officers at the exit of the Cross Island Ferry in Orient Friday afternoon. Local authorities say a walk-on passenger to a Cross Sound Ferry boat heading to Orient Friday morning “fit the description” of a suspect in the Boston Marathon bombings and set off a scare that drew dozens of police officers to Orient and New London, Conn.
Suffolk Police did apprehend the passenger, but determined he was not the suspect. As of 1:15 p.m., the man was being transported to Southold Town police headquarters to further check his status with county investigators — as a precaution, he said. Police were going to run the man’s fingerprints electronically through what’s called a “live scan,” to run the prints through state and federal databases. The live scan has replaced ink and roller as a means of taking prints, Chief Flatley said. Police at the scene also X-rayed the man’s bag, he said. A utility worker at the Orient ferry yard who did not give a name, told a reporter he saw police swarm the passenger and force him down on his stomach near the ferry’s snackbar. The worker said he thought at the time the man was being arrested. CARRIE MILLER PHOTO | Police were blocking traffic at the Orient Causeway on Route 25 just before 12:30 p.m. Friday. At least a half dozen Suffolk County police cars — their lights and sirens blaring — were spotted heading east on Route 25 in Mattituck about 11:40 a.m. Friday, for what could be shaping up to be a false alarm. 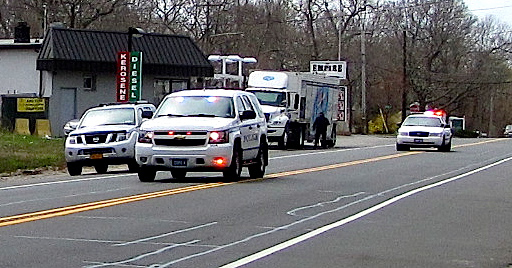 Police have shut Route 25 west of Orient, at the Orient Causeway, officials said, though some cars were being allowed to pass through as of just before 12:30 p.m.
CYNDI MURRAY PHOTO | Police vehicles heading east on Route 25 in Mattituck about noon Friday. The Day of New London newspaper reported before noon that police tactical teams also reported to the waterfront in New London for reports of “a possible suspect” in the Boston Marathon bombings Monday and subsequent shootings Thursday night in Cambridge. But The Day updated the site a few minutes later after reporting passengers were boarding the ferries as normal. Ferries at the New London terminal go to Block Island, although seasonally, Orient and Fishers Island. Meanwhile, schoolchildren have been told by police to remain indoors. Oysterponds School District Superintendent Richard Malone said he received a call from the police shortly before noon. “I spoke directly with the police and they told me to keep the kids inside and not to let anybody in or out,” he said. The Oysterponds school on Route 25 is not on lockdown, he said, but the district has staffers at the doors. Classes are continuing, Mr. Malone said, but he is awaiting word from the police on how to handle dismissal, which is at 2:45 p.m.
“The children are in the classrooms and we’re using the gym for recess,” he said. Police gave the same order to the neighboring Greenport School District, but the district’s school already had a half-day scheduled due to parent/teacher conferences. The children were dismissed at 10:52 a.m.
“We’re all secure here,” said district superintendent Michael Comanda, adding that though children were gone, staffers were still in the building. “We’ve got a person at every door and we’re monitoring the situation and waiting for the green light from the police,” he said. “It’s unexpected, but we’ve been practicing our lockdown and evacuation procedures regularly now we’re putting them to use,” he said. A Suffolk County police spokeswoman could not comment on the matter. Southold Police Chief Martin Flatley was not immediately available.